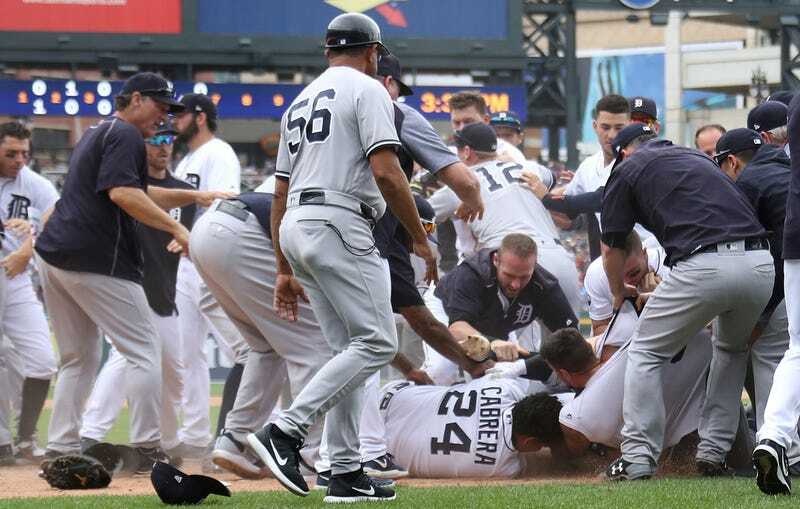 Most baseball fights are a bunch of meaningless posturing, but Yankees catcher Austin Romine and Tigers DH Miguel Cabrera exchanged actual punches and rolled around in the dirt during today’s game in Detroit. The tensions were already high in the fifth inning after Gary Sanchez got plunked by Tigers pitcher Michael Fulmer in the at-bat following his fourth home run of the series. Yankees pitcher Tommy Kahnle tried to retaliate in the bottom of the sixth by throwing at Cabrera, but missed. Kahnle and New York manager Joe Girardi were both ejected. Everyone seemed to calm down after a lengthy break in the action while Aroldis Chapman warmed up to replace Kahnle, but before Chapman could throw a pitch, Cabrera and Yankees catcher Austin Romine started a war of words that quickly turned into a bench-clearing brawl. Cabrera shoved Romine (whose brother, Andrew, plays for the Tigers and talked to his sibling after the fight), squared up, and got a couple of swings in before the two fell to the ground and were swarmed by their teammates. Both players were ejected. The two teams still appear to be grumpy. Yankees reliever Dellin Betances hit Detroit’s James McCann in the helmet in the seventh inning and benches cleared again, though not with as much fury as the first time. Betances and Yankees bench coach/acting manager Rob Thomson were both ejected. Update (5:01 p.m. ET): Here’s video of the Betances ejection. Additionally, in this exhausting game of masculine egos, the benches cleared again in the eighth inning when Yankees 3B Todd Frazier got beaned by Alex Wilson, who was ejected along with Tigers manager Brad Ausmus. Plus, Justin Verlander and Victor Martinez had an odd disagreement in the dugout, and a James McCann homer in the eighth inning beaned a Yankees fan out in left field. The Tigers won 10-6, as both teams will now wait to find out which of their guys will get suspensions.